Martin and Tessa long for a pony to live in the paddock at their cottage. But their parents are not sure about it and tell them they must wait. One day when letting Hoppy the poodle out for a run in the nearby woods they spot a pony. They ask Mr Rodd the farmer who owns the wood about it and he tells them the pony is Stormalong and used to belong to his son Pete. Stormalong was always hard to catch and one day he got loose in the woods and despite many efforts they were never able to catch him. He has been there for ages and Mr Rodd tells them that if they can catch him they can have him, as his son is now more interested in motorbikes than ponies, but would like Stormy to have a good home. The children are overjoyed with this news and after getting permission from their parents to keep the pony if they catch him, set off to do so. They soon find it is not an easy task. School takes up a lot of precious time and the wood is enormous. They do make some progress. By putting oats down at Stormy’s watering hole they manage to get closer and closer to him. But then they find they have rivals. The farmer has also promised some gypsy boys that they can have the pony if they can catch him. It will be a race to see who can get to the pony first! When they see the gypsies riding a pony into the woods in order to try and entice Stormy to follow them, Tessa and Martin decide to try the same trick and borrow a friend’s pony but it still doesn’t work. Their parents are getting fed up with them going out to the woods at all hours and think their home work may be suffering. They are only allowed a few more days to try. In a last gasp attempt, they ask some of their pony owning friends to come to the woods and hope that seeing all the ponies may entice Stormy. But all does not go well and one of their friends falls off his pony so that it too gets loose! Now there are two loose ponies instead of one! But Tessa comes to the rescue. Can disaster turn into triumph for the children? Elinore Havers is one of my favourite ‘comfort read’ authors. Although there is never anything of great depth in her stories, they are nevertheless very easy to read and always have pleasant plots and characters. She seems to have written two types of pony book: adventure stories such as Pony Watch and Pony Sleuths, and more traditional pony stories in which the plot is focused on a pony rather than some mystery. These are my favourites of hers and include such classics as Dream Pony and Only One Pony. Although not quite as good as those two books, this story is set in the same mould. The plot, that of two ponymad but pony-less children being allowed to keep a pony if they can catch him, is a little out of the ordinary. The story is centred upon the various plans the children come up with to try and catch the pony. It is fairly slow paced and gentle, although there is some tension provided by the gypsies who are the children’s rivals in their hunt to catch Stormy, making the pursuit more nerve-wracking and urgent. There is also a 'false alarm' element of danger in which the children come across a mysterious figure with a gun in the woods one night. The reader is expecting something to come of this, but it just turns out to be Mr. Rodd’s son after a pheasant. It was probably just added to spice up the story a little. However, as I said earlier, I think the author’s best books are those which are not adventure-orientated and this I feel was a bit of over-kill. The main quibble I have with the plot is the rather tired old ‘gypsy’ plot device. I do get a little sick of reading books where gypsies are always the villains. Although they do not actually steal any horses in this book they are still portrayed in a bad light. Their own pony is badly kept and thin, and they are seen to steal the children’s oats. Obviously the author needed a pony catching rival who would potentially not be a good owner to the pony, in order to increase tension, but I think the story would have worked just as well if another unpleasant non-gypsy character was used in this role. The characters in the book are likeable, if not portrayed in too much depth. There is also humour in the story of a gentle sort, such as when the kids disguise a grey pony as a skewbald in order to pull the wool over someone’s eyes. There is nothing unpleasant or unsavoury in the book at all, but there is the potential for unhappiness if the gypsies catch Stormy and he is badly treated. So the author manages to provide tension without anything too nasty happening, quite an accomplished feat, and a useful skill in a writer of children's books. There is very little instructional element in this book, and no competitions or gymkhanas (as is the case with most of the author’s books) but there is instead a sense that her characters really care about their ponies as animal friends rather than just a device for winning, as is the case in many pony books where shows are heavily featured. 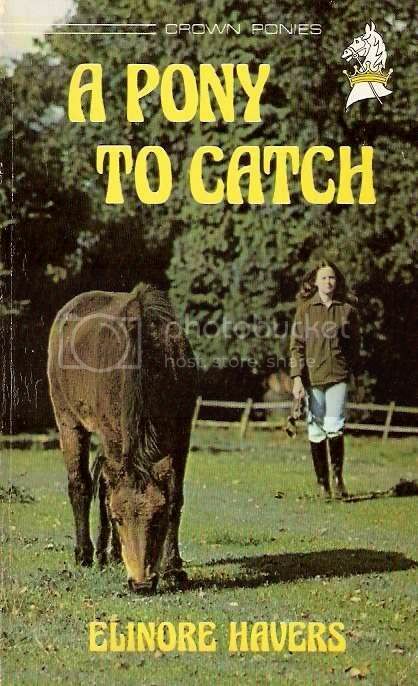 Ms. Haver’s non-adventure books tend to focus on more down to earth pony problems such as having to choose between two ponies (Only One Pony), what to do with a loved but ageing pony (Dream Pony) or in the case of this story, how to catch a loose pony. To me, this is the sort of pony book which appeals, although I realise these stories may come across as boring to many readers, and for that type of reader this book may also seem slow and unexciting. All in all a slow paced traditional story which will probably not appeal to those readers who prefer a bit of excitement and danger in their stories or those who like plots involving shows and gymkhanas. But for a gentle piece of escapism or a nice comfy read, it hits the spot.